According to the calendar, today is the first day of Spring, though I am not so sure the weather has gotten that memo. In Saint Louis, the early spring bulbs are just beginning to peak out of the ground. If they are like the groundhog, they may go back down. I am ready for winter to end. 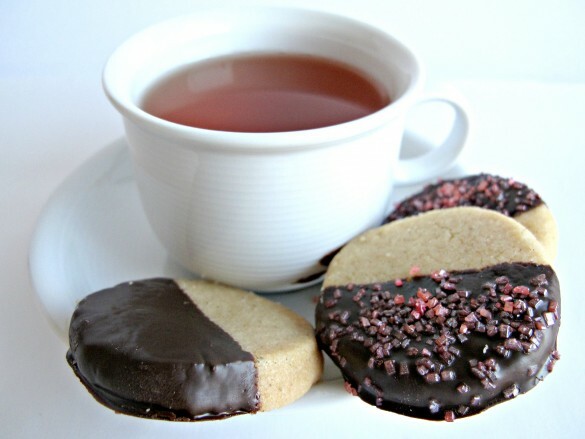 While I wait, Chocolate-Dipped Peach Tea Shortbread Cookies are filled with flavors of the seasons to come, yet pair perfectly with a warm cup of tea to ward off unseasonable cold. 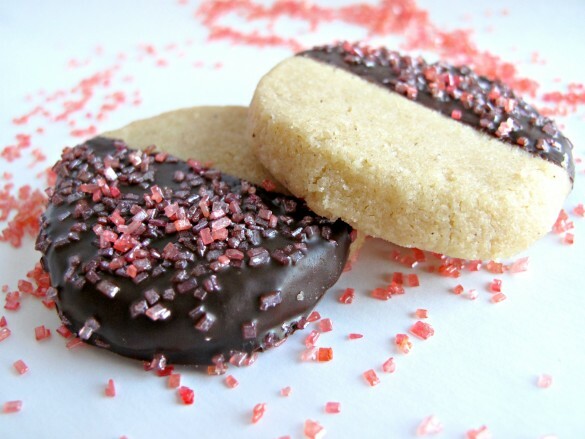 Coating the shortbread in creamy dark chocolate turns simple cookies into comfort food. Chocolate-Dipped Peach Tea Shortbread Cookies get their flavor from peach tea leaves. Using tea as a flavoring was new to me, so I researched and found several ways to add tea flavor to baked goods. After a few trial runs, I found that the cookies with the best flavor and texture were made with infused butter. Infused butter sounds much more impressive and complicated than it actually is. Go ahead and be impressed if you like, but don’t run away because you think this recipe is too involved. This technique takes less than 15 minutes. The tea leaves are simply seeped in melted butter (just like when you make tea to drink but with butter instead of water). After 10 minutes the butter is poured through a fine mesh strainer to remove the leaves. That’s it. The butter, infused with fragrant peach tea, is mixed with just a few other ingredients to create melt-in-your-mouth, crunchy Chocolate-Dipped Peach Tea Shortbread Cookies. A dip in dark chocolate gives the cookies a flavor boost and a little sparkling sugar adds bling. Recently, my penchant for chocolate dipping and drizzling the Monday Box cookies came to the attention of the enthusiastic purveyors of chocolate at Chocoley.com . I imagine that they noted my dissatisfaction with the “chocolate” coatings I had been using. Pretty? Usually. Tastes like good chocolate? No. But what choice did I have when chocolate tempering is just not in my skill set? “Bada Bing Bada Boom Dipping and Coating Formula,” they said. I was intrigued to find out that Chocoley sells their own formula of melting chocolate with the taste of real chocolate in easy-to-melt discs that don’t require tempering. Chocoley.com sent me their products to try. 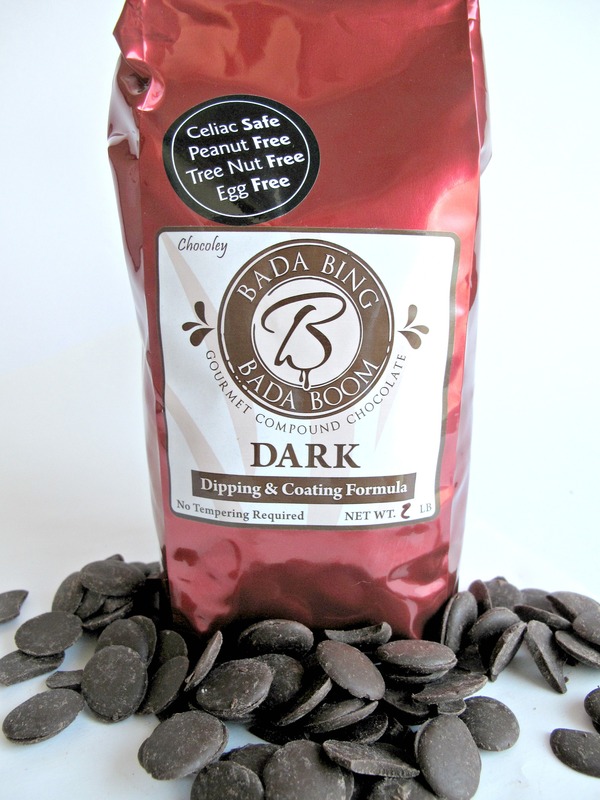 The beautiful smooth chocolate coating on these Chocolate-Dipped Peach Tea Shortbread Cookies is the dark chocolate Bada Bing Bada Boom Dipping and Coating Formula. The chocolate came with detailed directions involving candy thermometers and temperatures to ensure successful dipping. My candy thermometer chose today to go AWOL. I proceeded carefully but without temperature measurements. I melted a cup of the chocolate discs in a double boiler, stirring just until all of the discs were melted. Then half of each cookie was dipped in the chocolate and placed on a wax paper lined baking sheet. The dipped cookies were refrigerated for 5-10 minutes to set the chocolate. The thin chocolaty coating looks almost professional to me (except for occasional finger prints). 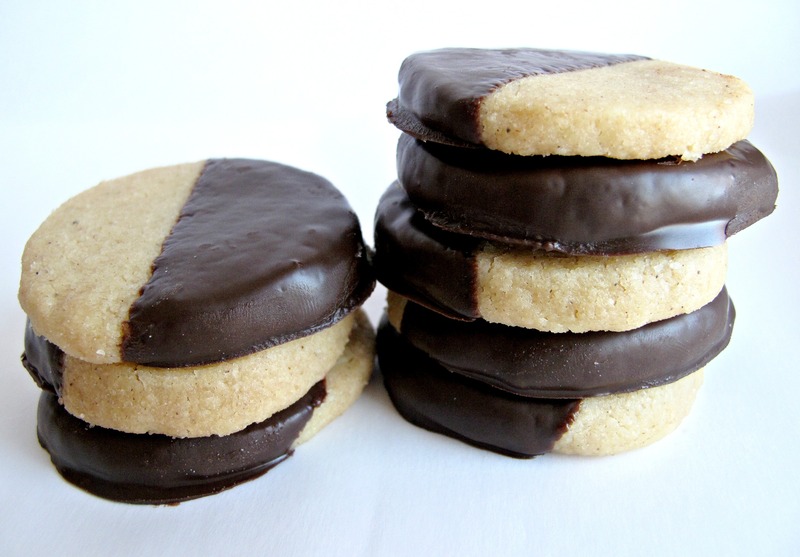 The flavor of these cookies….just imagine chocolate covered peaches. 2 tablespoons peach tea leaves Slightly less if tea is finely ground. I used the leaves from 6 Republic of Tea Ginger Peach round bags. In a small saucepan over low heat, melt butter with tea leaves. When the butter is completely melted, remove from heat and allow to seep for 10 minutes. Remove the tea leaves from the butter by pouring the butter through a fine mesh strainer into a medium mixing bowl. Discard the tea leaves. Stir in sugar, vanilla, and salt. Add the flour and stir until combined and a dough forms. The dough will be slightly crumbly but should hold together when formed into a log. Form the dough into a log about 12 inches long (with a 1 ½” diameter) and place onto the center of a sheet of parchment paper. Fold the parchment over the dough and push a ruler edge or dough scraper against the bottom of the log to remove air pockets and compress the dough. Wrap the compressed dough log in the parchment paper then in plastic wrap. Inserting the wrapped log into a cardboard paper towel tube will help keep the log rounded on all sides. Refrigerate for about 2 hours until firm enough to slice. WHEN READY TO BAKE: Preheat oven to 325˚F. Line a baking sheet with parchment paper. Slice the dough log into ¼” rounds and place on the prepared baking sheet about 1” apart. Allow cookies to cool for 10 minutes on the baking sheet before moving them to a wire rack to cool completely. Line a baking sheet (that will fit in your refrigerator) with wax paper. Dip one half of each cookie into the melted chocolate. To remove excess chocolate, with the cookie still held over the pot, tap gently on the wrist on the hand holding the dipped cookie. Place on the wax paper. If using decorating sugar, sprinkle immediately after dipping. 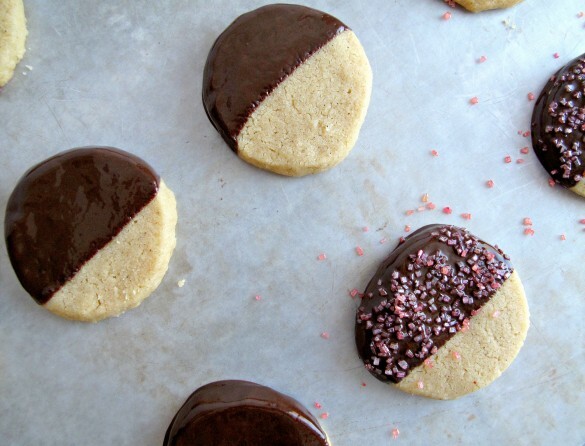 Refrigerate the dipped cookies for 5-10 minutes only, to set the chocolate. Cookies must be completely cool and/or chocolate completely set before storage. Store at room temperature in an airtight container for at least 1 week. Separate layers of cookies with waxed paper. Uncooked dough logs can be refrigerated for 3-4 days or frozen for 1 month. Double wrap columns of 4 or 5cookies (with squares of waxed paper between the cookies) in plastic wrap, then place in an airtight container or zip lock bag. Mail buttery and/or chocolate-dipped cookies only in cool weather. These look adorable and really tasty! What a fun and pretty way to celebrate spring! Infusing the butter with the tea leaves sounds like a great way to go! 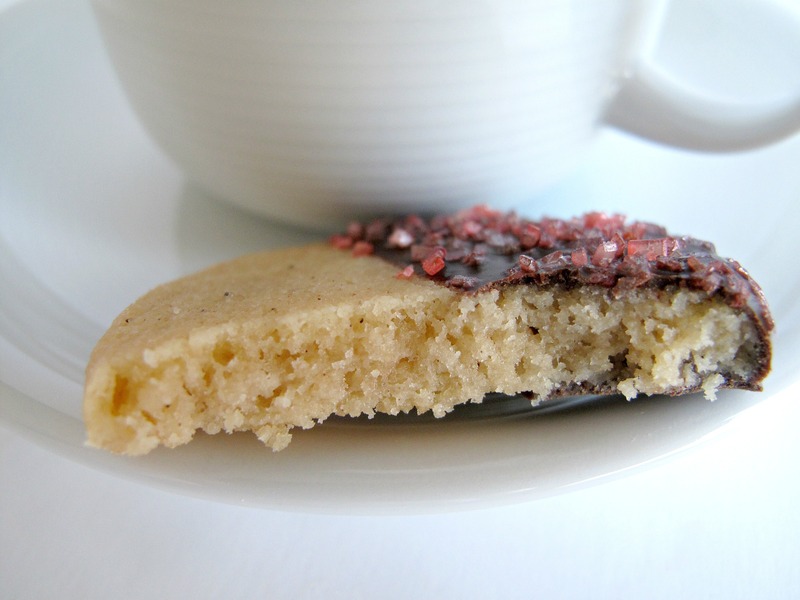 I’ve been wanting to play around with tea in baked goods so I am definitely going to have to give that method a try! And I mean chocolate covered peach cookies?? Sign me up for that! The only other way that gave real tea taste was grinding the leaves and putting them in the cookie. The tiny bits are only minimally noticeable in the texture (a little gritty) but I thought there was a bitter aftertaste (well, yeah, you are eating tea leaves). Infusing the butter is so easy and then you just proceed as usual with a recipe. I can’t wait to see what you come up with, Ashley! teehee I am eager for winter to end as well! It’s been wicked here in NJ and I need some spring in my step. 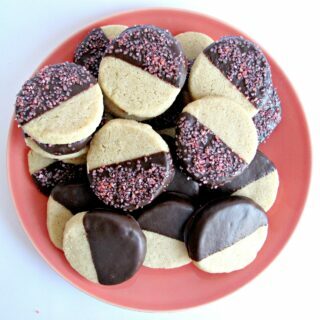 🙂 I bet these shortbread cookies are just the thing I need! Love how you dipped them in chocolate, too. Chocolate brightens everyone’s mood! Thanks, Jess! I agree that chocolate dipping ups the deliciousness factor! Have a cookie and imagine a glorious and warm spring! these sound too good to be true! what an amazing flavour combo! These looks delicious and so pretty too. Peach tea is a favorite in our house! Thanks, Tricia! I am so glad your comment finally worked! I am fine with technology as long I am not expected to fix anything! peach!! baked goods with tea are awesome, and peach is one you don’t always see! love the steeping method, too; very creative and i bet it flavors everything wonderfully. now what’s that you say about it being spring? because…i saw snowflakes outside yesterday, and i just saw someone walk by the window with about 39 jackets on. 🙁 i…want…spring. I too want spring…that’s where the peach tea in cookie idea came from! Peach just screams warm weather to me. The infusing methods are not mine….I did “Shannon-style” research to investigate the methods of the rich and famous. I then spent days baking and force feeding cookies to my taste testers. …..well, the first 3 batches were eaten enthusiastically,all cookies after that required coaxing:) these really are lovely with a glass of iced tea or a cup of steamy tea. I never heard of that technique before! I love peach iced tea! I think I’d have a cookie with peach tea to drink it with – double peachy. I was approached by the same company but was hesitant. The chocolate looks so smooth and perfect – I’m glad you found something that finally worked for you. I have been using Guittard wafers lately with good results. The infused butter worked really well, Reeni, and I am looking forward to trying it with different teas. I agree that these cookies would be wonderful with a glass of iced peach tea! Did you order your Guittard wafers online? We don’t seem to have them available locally. The Chocoley wafers produced such a thin, lustrous coating with a snap. A big step up from candy melts! The Chocoley people are great to work with. Email me if you want further details. I had an excellent experience with Chocoley. What a good idea to infuse the butter with the flavor from the tea leaves! 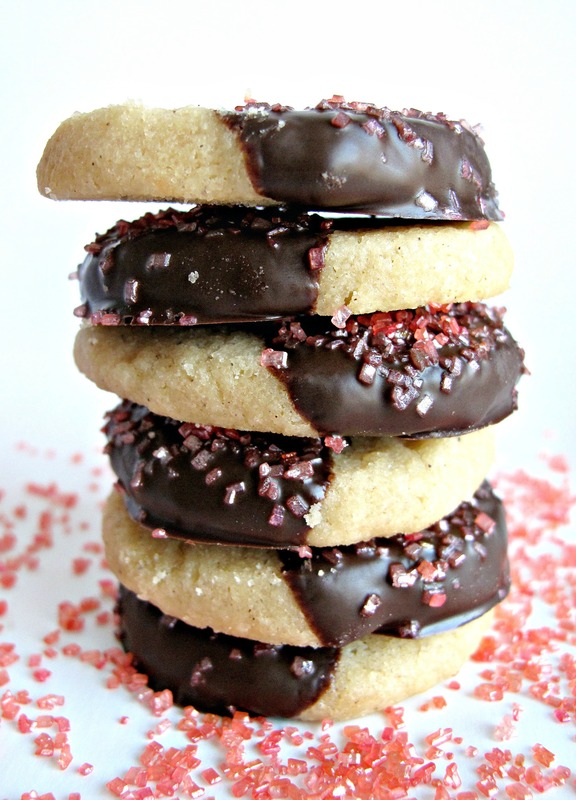 I love shortbread cookies, and these are so pretty! Looks great! Did you use the black or green peach ginger tea? Thanks! !